12 Bones Corn Pudding is one of the most delicious corn puddings you will ever taste. It’s a casserole you will want to eat all summer long and it deserves a place on every holiday table. This recipe is from 12 Bones Smokehouse. 12 Bones is one of my favorite restaurants in Asheville, NC. Their Blueberry Chipotle Ribs are to die for! I’ve tried lots of corn pudding recipes through the years, and they’ve all been delicious, but this one is extra special. It has poblano peppers in it which gives it tons of flavor and a little heat. 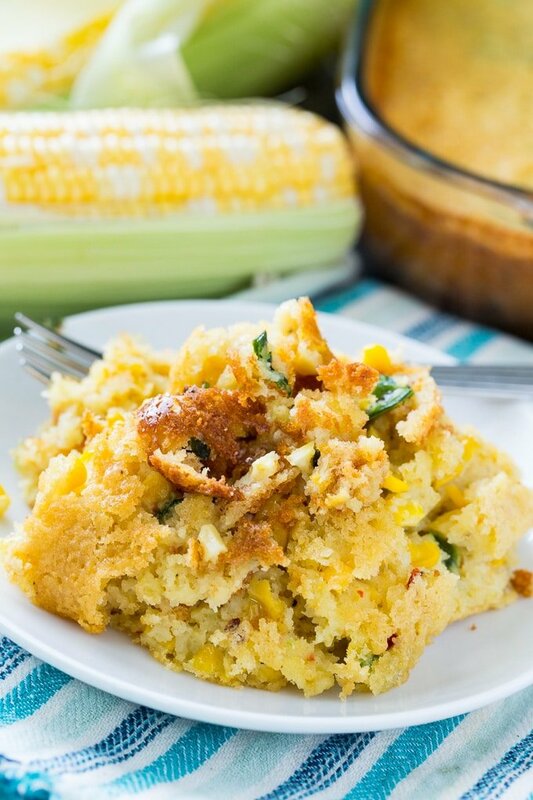 A mixture of fresh corn and creamed corn gives 12 Bones Corn Pudding lots of corn flavor. 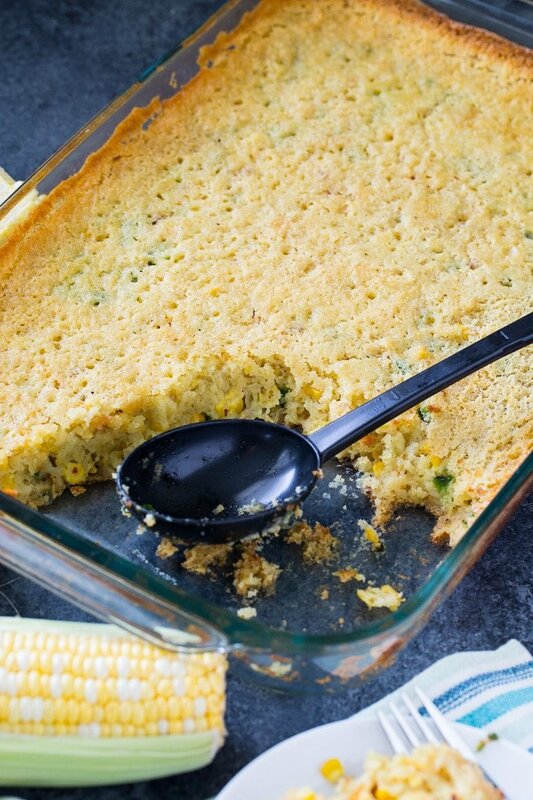 This corn pudding is very quick and easy to prepare and it makes a large amount. You bake it in a 10×15-inch pan so it is perfect for big holiday meals or a neighborhood potluck. There’s a lot of sugar making this a very sweet corn pudding. It could almost pass as a dessert. There’s also lots of heavy cream and butter. You know this is going to be good. Some cumin and ground coriander along with the poblano pepper give it a little southwestern taste. With a side this good, you won’t even care what the main dish is! 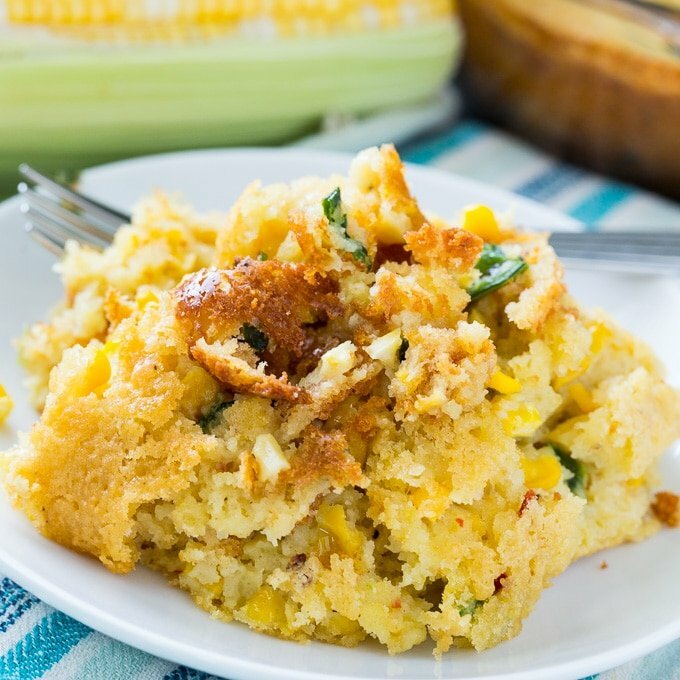 12 Bones Corn Pudding is one of the most delicious corn puddings you will ever taste. Plenty sweet with lots of smoky flavor. Preheat oven to 300 degrees and lightly grease a 10x15-inch baking dish. In a medium bowl, whisk together the eggs, melted butter, heavy cream, and canned corn. Stir in the peppers and corn. Pour batter into prepared pan. Tent with foil and bake for 1 hour. Remove foil and bake another 30 minutes or until center is just set. Note: The amount of baking powder is not a typo. It seems like too much, but this recipe really works. This entry was posted in Casseroles, Side Dishes and tagged corn. Bookmark the permalink.